I don’t think you’ll be the one doing the hurting Eves. 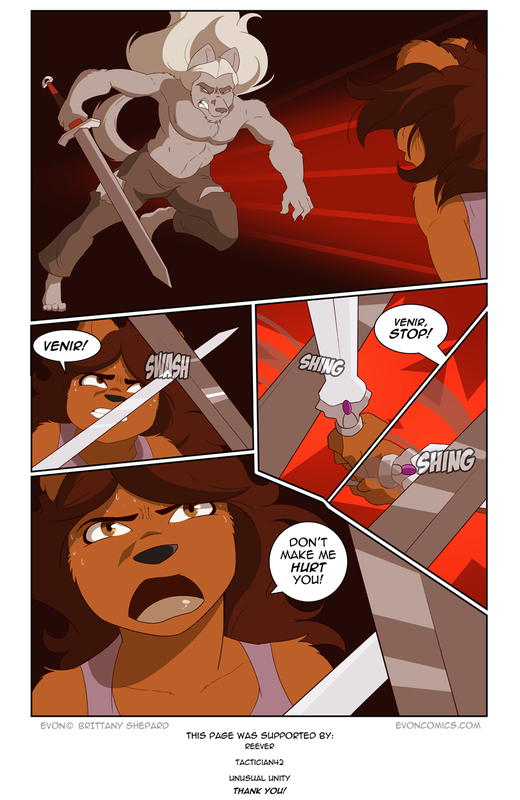 OK, last page showed blood on Venir’s sword, this page does not. That’s confusing. Methinks Evon is gonna let loos with a bit of accidental magic. Maybe. Belvidier and Evee? or even Evee and anyone? Only if she’s playing a game. I doubt anyone can play Belvidier. How would those two (Belvidier and Evee) even meet? That said, I would expect Evee learning more than the obvious from such a situation, because Belvidier would completely out-think her. Also, is that “top 10 for the month” or “top 10 at any point”? I will count it if it reaches top ten and holds it for a day. Technically, they have sort of already met. Evee was created post the first castle visit so she would remember Belvidier and knows where the castle is. She was able to locate them last time on the way to Evon’s castle, so it would make sense she could track them back to a location she already is aware of. And now that we know Belvidier is apparently scary dangerous (based on the witch hunter’s respect of his abilities), I could see him approaching Evee before she’s able to do anything serious and contain her magic (assuming he is also a witch hunter of some sort). That could temper her rage possibly… I think it would be really interesting. Here’s hoping we get it. I tend to think of Evee as a separate person with “implanted memories”, so while she might know of Belvidier and Hero’s castle is, they’ve never actually met. Belvidier overcoming Evee I wholeheartedly endorse. That might even hook Evee on getting Bel’s attention and lead to something akin to the incentive sketch. Of course Bel’s the one in control there, and Evee wouldn’t be there unless she liked it. Belvidier and Evee, hmmm. Either she comes to Castle Dent looking for Hero and runs into Belvidier who manages to seriously impress Evee when he gets the best of her in combat. Or, Belvidier as a favor to Evon, goes to her castle to help set her house servants in proper order, only to discover Evee there and winds up in bed with her after he manages to seriously impress Evee by besting her in combat. It’s currently #28 with 289 votes, and #10 has 1,111. Technically losing ground; currently #39 with 425 votes (-11 places for +136 votes), while #10 has 1,992 votes (+881). Now #40 with 490 votes (-1 place, +65 votes); #10 has 2,362 (+370) votes. The gap in votes has gone from 822 to 1,567 to 1,872, so it’s not looking good. Continuing to fall behind; #42 with 532 votes (-2 places, +42 votes), #10 has 2,778 (+416) votes. The vote gap is now 2,246 (+374). Why in all holy hells would Belvie of all people have anything to do with Evee? o_O Nevermind that she looks exactly like Evon, but she’s also a bit of a psychopath. sadly i don’t see Evon making it into the top 10. it just doesn’t have the readership for it. i vote every day, sometimes twice when i remember. if all else fails though, maybe it could end up as a non-canon mini comic? I wonder how prepared she needs to be to use a levitation spell on Venir? Ah, the sounds of sword against sword, and somewhere in the village Hero is going ‘I know that song’ and is heading for its source.